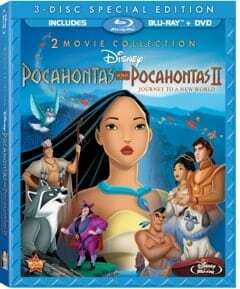 On August 21, 2012, Disney’s Pocahontas and Pocahontas II: Journey to a New World will appear in high definition in a Blu-ray DVD combo pack for the first time ever. Both of the Disney action packed animated adventures tell tremendous tales of bravery, friendship, and acceptance filled with unforgettable music and lovable animal sidekicks. Disney’s Pocahontas is loosely based on the true life events of Chief Powhatan’s daughter Pocahontas and Captain John Smith, a man who had a large role in the founding of the first English settlement in North America. The Disney version strays from historical facts and creates a beautiful and moving love story between the Indian princess and the English explorer. Pocahontas (Irene Bedard) has been having strange dreams of a spinning arrow, but she does not know what they mean. She seeks the guidance of Grandmother Willow (Linda Hunt), and begins to suspect that her dreams may be connected to the arrival of pale faced visitors from across the ocean. Governor Ratcliffe (David Ogden Stiers) believes that the “savages” have gold in their land, and instructs all of the men who are settling in Jamestown to dig for it. Meanwhile, Captain John Smith (Mel Gibson) encounters Pocahontas as he explores the strange new land and they have an instant connection with one another. A misunderstanding occurs between John Smith and Pocahontas’s people, and her father plans to execute him the next morning. Pocahontas begs her father to spare his life, and to find a way to peacefully coexist on their land with the new arrivals. It has been years since the last time I watched Pocahontas, but all of the words to the music and even some of John Smith’s witty lines all came rushing back to me. I couldn’t stop myself from singing along and gripping the cushions of my couch during the most dramatic scenes. I laughed at the scene-stealing antics of my favorite raccoon, Meeko, and teared up when Pocahontas and John Smith declared their love for one another. And just like every time I had watched Pocahontas before, I wanted to change the ending to have that perfect happily ever after. Pocahontas II: Journey to the New World begins in London with a shocking action scene involving Captain John Smith (Donal Gibson) before switching over to a fun winter scene with Pocahontas and her dear friend Nakoma. Chief Powhatan learns that the British are planning on sending an armada to their land because of the lies of Governor Ratcliffe (David Ogden Stiers). In order to convince the British monarchy that they should not start war with them, Pocahontas journeys to London to represent her people. Under the tutelage of John Rolfe (Billy Zane), Pocahontas must learn how to dress and act like the British. At first, she delights and charms King James (Jim Cummings), but Ratcliffe sets her up to cause conflict amongst the court. Now imprisoned, Pocahontas’s only hope for rescue is the unlikely team of John Rolfe and John Smith, whom Pocahontas had believed to be dead. Once she is out of harm’s way, Pocahontas must once again listen to her heart to find her path. Pocahontas II: Journey to the New World did not quite live up to the original for me, but I loved the breathtaking animation of London, and especially the underwater passageway to the famous Tower. This film is just as action packed as the first, and I loved watching Pocahontas grow as a character and determine her own fate. Though this film accurately follows Pocahontas’s real life romance with John Rolfe, I was still a fan of John Smith. I think many who know some of the true facts of Pocahontas’s life will definitely appreciate that this film more accurately depicts what becomes of her. I was so very thrilled that Meeko, Percy, and Flit were back to steal even more scenes; there is quite a bit of humor that will appeal to both parents and children. Drawing Inspiration: The Lost Story of Hiawatha is a fascinating look at a project that Walt Disney never completed due to financial restraints. It is based on a poem by Henry Wadsworth Longfellow, and follows a young Indian boy as he grows into manhood. Check this fun extra out to see the story that Disney wanted to tell. The Music of Pocahontas takes Disney fans behind the scenes with footage Alan Menken and Stephen Schwartz as they work on the music and lyrics for Pocahontas. Pocahontas Audio Commentary lets viewers watch Pocahontas with the commentary of co-directors Eric Goldberg and Mike Gabriel and producer James Pentecost for fun facts about the this film. Little Hiawatha Short is a short film from the Silly Symphonies collection, featuring a young Indian boy attempting to hunt an adorable and expressive bunny.